ProZ.com Business members « Translator T.O. Projects can now be defined for any given client, and they can include one or more work orders. Among the information in a project you have a field for project instructions, and these instructions will be displayed in all jobs associated with the project. This is a very cost-effective way of conveying your reference information. A project can also be used, for instance, to coordinate the several interpreting and translating activities associated with an event. Reference files can be added when a work order is created, or to an already created job. These files used to be located in a separate tab on the job page, and they have been now to the main job page for improved visibility. Client files are files that can be associated with any of your clients, and they will be offered as reference files on the main page of every job created on behalf of that client. A category (glossary, reference, style, TM or other) can be associated with each file. It is now possible for a company to decide if the service providers sharing a job will be able to see each other and interact among themselves. Also, managers can post in any job messages addressed to a particular provider in the job, or to all providers in the job, or only to other administrators. 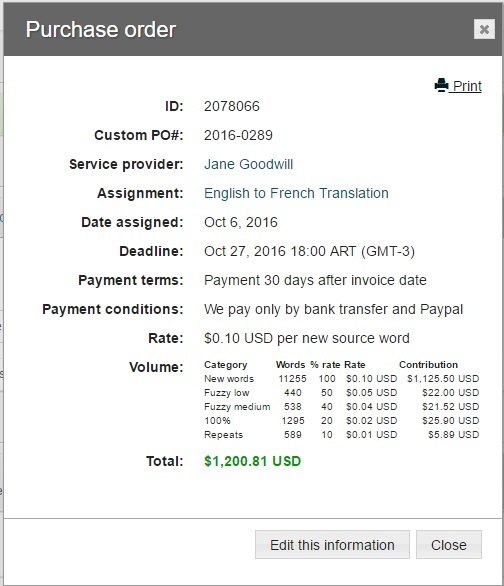 Administrators can also view all comments or only the comments visible by any given translator in the job. The list of providers that can be reached by selecting “Providers → View providers” has several search criteria for defining a subset of translators, and at the bottom of the page there are buttons for sending emails to the translators in the whole search (in particular, to all translators in your system) or only to those in the page in front of you. It is now possible to attach a file to these mails, and to select the particular translators you want to reach within the selection. The translation center as seen by service providers was greatly simplified, eliminating all elements that were not needed for their role of accepting an assignment, getting information and delivering their service. This will facilitate adding extra features and information and move into mobile operation. 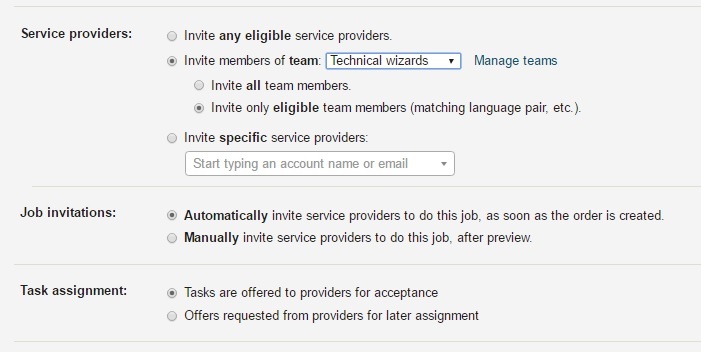 Two new job settings will make it possible for your PMs to leave feedback on the providers in your system for each delivered task. You can also decide if this information will be visible only for your administrators, or to share it also with the providers. Posted feedback can range from unacceptable to excellent, and a comment can be also entered. This information is stored for each translator, and it is a very useful tool for documenting the experience a company has with a given translator, especially in multi-PM companies. You can read more about this feature in a dedicated article. If you invite translators to the translation center by email, using the options available at “Providers → Invite via email”, you can now select several language pairs associated with each translator. 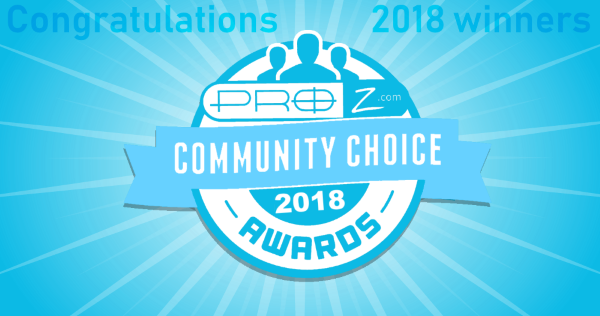 If you prefer to use the directory features to be found at “Providers → Invite from ProZ.com”, once you select the translators to invite the system will offer you for each provider the language pairs they declare at their ProZ.com profile, and you will be able to select one, some or all the language pairs offered. In both cases, the provider profiles at the translation center will be created with the language pairs selected by you.